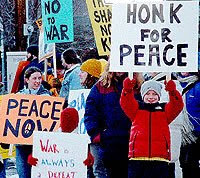 The City of Burnsville has dropped charges against a women for honking in support of peace. Barbara Gilland honked to support protesters who were holding signs saying 'Honk for Peace' along a public road in Burnsville, MN. "The ACLU of Minnesota represented Barbara Gilland, saying that the issuing of the citation violated Ms Gilland's First Amendment rights. The City of Burnsville agreed to drop the charges and to no longer issue citations for improper use of horn when using it to express freedom of speech, except when necessary to preserve public safety. The City also agreed to issue a directive to officers and update its Policies and Procedures to prevent free speech violations in the future." The interesting thing about this is the officer who wrote the ticket. He lived nearby and seemed to want to personally run the protesters out of Burnsville...almost like a personal vendetta. It's ironic to me that a 'Peace' Officer doesn't support 'Peace'! No other motorist(s) have ever been ticketed for honking in Burnsville before the peace vigil started. We should all be thankful to Barbara Gilland for choosing to fight for her rights to honk rather than pay for the ticket... and especially thankful to attorney Howard Bass who as an ACLU volunteer attorney gave of his time and talent to defend this first Amendment rights.